Although not part of our Five Best Bets, the shock of the weekend, besides the snow storm which reeked havoc on the Northeast, was the St. Louis Rams’ defeat of the N.O. Saints, 31-21. 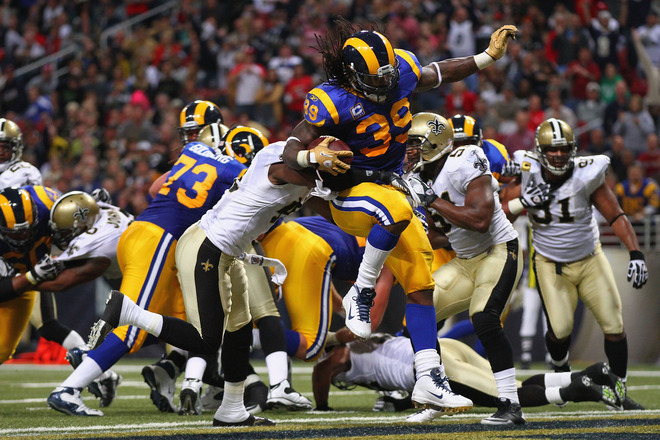 Steven Jackson went off for 159 yards on 25 carries and 2 TD’s, and incredibly the Rams led 17-0 at halftime. Perhaps they were inspired by some of the basesball Cardinals who were in attendence.Whatever the reason, they played like a team possessed. Props to the Rams! BILLS over REDSKINS- This was one of our losing two picks yesterday. And it was an ugly one for sure! The Bills beat the Redskins 23-0 in Mike Shanahan’s first shut out in his 24 years in the NFL, either as a head coach or offensive coach. 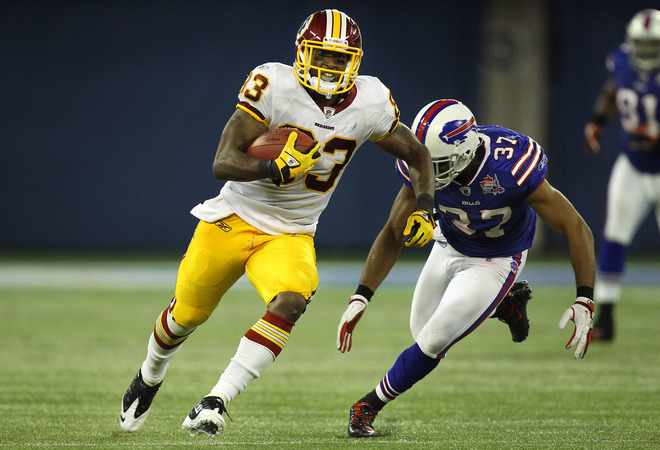 John Beck & the Redskins were not able to muster any offense vs the Bills as they only had 178 total yards of offense; just 26 yards rushing! 75% of their total yards came from the 2 guys we mentioned last week-TE Fred Davis and WR Jabar Gaffney. Beck had pressure on him all day as the Bills, uncharacteristically, sacked him 9 times; 2 shy of their franchise record. Playing in Toronto was different this year than it had been in the 3 previous years. “This was definitely the most exciting crowd we’ve had since we’ve played up here,” said Bills Safety George Wilson. 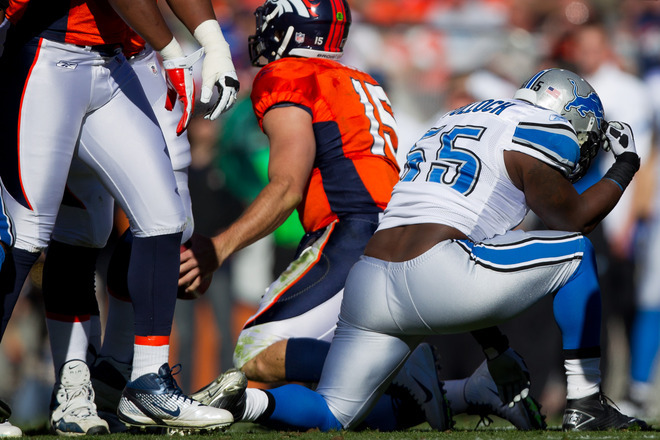 LIONS over BRONCOS- In our only other loss yesterday, it too was U G L Y and bizarre. Ugly because anytime a team loses by 35 points, it’s ugly! But it was a very strange game if you look at the totals following the massacre. Three things stand out because they were all so very close (for a lopsided game): First downs 21 Lions-19 Broncos, total yards 376-312, and time of possession 29:34 to 30:26. The two stats that just killed the Broncos were the three turnovers and the seven sacks of Tebow. Terrible Tim (18-39) was totally ineffective as he was under pressure throughout the game. No miracle comebacks on this day…The (2-5) Broncos travel to Oakland (4-3) and play in the Black Hole this week. TEXANS over JAGUARS- Coming into this game, the Texans were off to their best start (5-2) in franchise history. They beat the Jags yesterday 24-14. 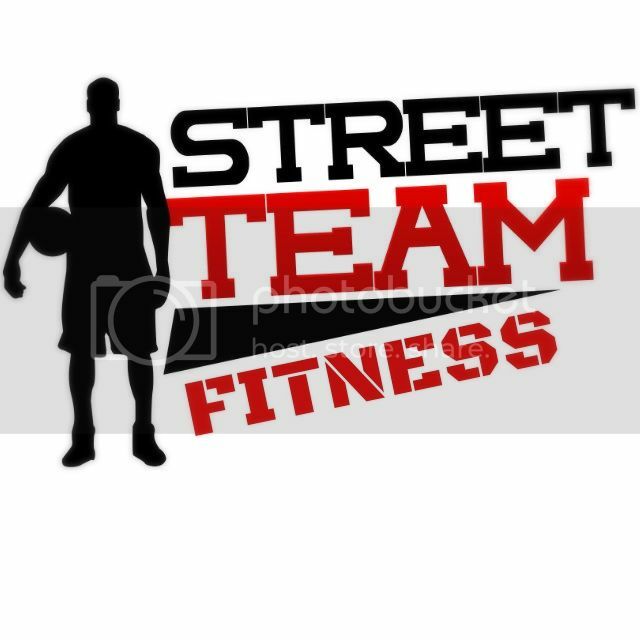 So far they have outscored their three games vs division opponents by an overwhelming 98-28 and will need to continue this dominance if they hope to go to their first playoffs in team history. 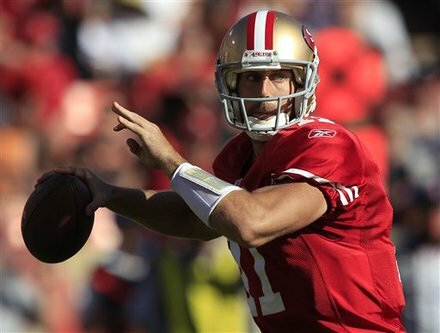 49ers over BROWNS- The 49ers beat the struggling, injury plagued Cleveland Browns. For the niners it was their fifth win in a row; a feat they haven’t accomplished in a decade (2001). As we’ve mentioned, their staple this year has been their stellar defense. They had four sacks, one INT, and held the Browns to 10 points. Alex Smith had no picks and the steady RB Frank Gore had 31-134-1 on the day. S.F.’s only loss has come vs Dallas-by 3 points. They head East to play the Redskins next and should go to 7-1. 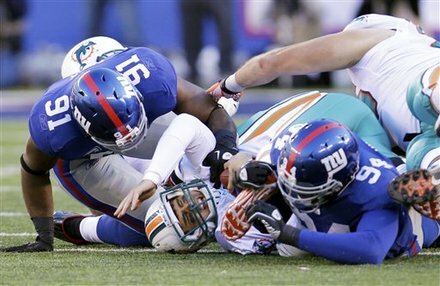 GIANTS over DOLPHINS- One thing’s for sure..if the Giants play the way they did yesterday vs the Dolphins, they will not make it to the playoffs this year.. They kept Miami in the game way too long and then in the fourth quarter decided to play some ‘D’. “I’m starting to see gray hair”, said defensive capitan Justin Tuck. Four of the Giants’ five wins have been won the fourth quarter. We said that Big Blue should win this game by two touchdowns but that they will probably keep it close. Three points is TOO close if they expect to compete against New England and San Francisco on the road over the next 2 weeks. nobody saw that Rams win coming. If they say they did they are lying. Not sure the Rams knew either…probably one of the biggest upsets this year. They play the 1-6 Cardinals next week..They might even win 2 in row!